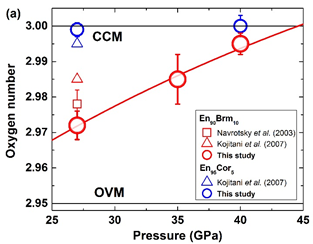 The solubility of the MgAlO2.5 component in bridgmanite was measured at pressures of 27, 35 and 40 GPa and a temperature of 2000 K. Compositional analysis of recovered samples demonstrated that the MgAlO2.5 component decreases with increasing pressure, and approaches virtually zero at 40 GPa. Above this pressure, the MgAlO2.5 component, i.e., the oxygen-vacancy substitution, becomes negligible, and Al is incorporated in bridgmanite by the charge-coupled substitution only. The oxygen number to the bridgmanite unit formula, which should be 3 if the MgAlO2.5 content is zero. The oxygen number becomes virtually zero at pressures above 40 GPa.